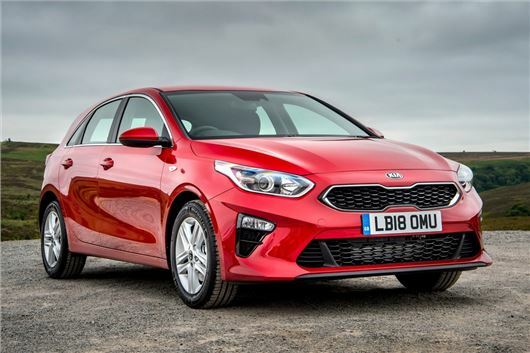 Kia has announced UK prices and specifications for its new Ceed ahead of sales starting on 1 August. The new Volkswagen Golf and Ford Focus rival (which we say feels every bit on par with the Golf) will start at £18,295 - making it marginally more expensive than the latest Focus. That price is for the 1.0-litre petrol T-GDi engine paired with the six-speed manual gearbox in entry-level 2 trim. Highlights include cruise control with speed limiter, air conditioning and automatic headlights. Other features include 16-inch alloys, chrome window surrounds and LED rear lights, while the interior gets cloth seats and a seven-inch touchscreen infotainment display with Android Auto and Apple CarPlay. A reversing camera is also standard on the base model, as is a host of safety features include lane assist and driver attention warning. A special Blue Edition model is available from launch, starting at £21,095 and paired with the new 1.4-litre T-GDi petrol engine. Finished in Blue Flame paint, the special edition adds 17-inch alloys, privacy glass, electrically folding door mirrors with LED indicators, rear parking sensors and LED headlights with cornering lights. Inside the Blue Edition, black faux leather seat bolsters are standard, as are sporty stainless steel pedals and a USB fast charger in the centre console. There's an eight-inch touchscreen navigation system, while opting for the seven-speed DCT automatic transmission (£22,195) will also add selectable drive modes. Prices for the 3 grade are yet to be confirmed. Based on the 2, the 3 adds 17-inch alloys, privacy glass and rain sensing front wipers, as well as black cloth seat trim with faux leather bolsters and power lumbar support for the front seats. An eight-inch navigation system with European mapping is standard, as is dual-zone automatic air conditioning, electrically folding door mirrors with LED indications and kerbside lights, an auto-dimming rear-view mirror and rear parking sensors. Even the horn gets an upgrade. Sitting at the top of the new Ceed range, the First Edition model starts at £25,750 and is packed with tech. A smart parking system uses front and rear parking sensors to automatically park in parallel or perpendicular spaces, while adaptive cruise and selectable drive modes are standard with the £26,850 dual-clutch auto. Inside gets black leather seats, heated and ventilated front seats, heated outer rear seats and a 10-way power adjustable driver's seat with memory. An electric sunroof is also standard, along with LED bi-function headlights, an electronic power brake, heated steering wheel, stainless steel pedals and a premium sound system with wireless mobile phone charger. Kia has also announced that its revised Sportage will start at £20,305, with a mild-hybrid version being added to the range. The new Ford Focus is a much better car. Kia are a budget brand trying to become a premium brand but the only thing premium is the price. As most brand new cars are bought on PCP and only kept for 3 years the 7 year warranty is of no benefit. Sounded as if you spoke with authority, shame your knowledge lacks depth. The most important influencer when decideing leasing rates is...depreciation. The 7 year warranty provides the reassurance to those who decide, that Kia cars have factory warranty backing, more than double that of most others, hence leasing rates are relatively lower, as a result. Please feel free to dispute this information, with facts. Kia, Hyundai, Ssangyong, Toyota all cars with long warranties depreciate just as fast if not faster than Ford. You can easily negotiate large discounts off a Ford unlike the brands with the longer warranty. The leasing rates depend on a number of things such as annual mileage and deposit. The long warranty is just a quick way to sell these cars. Why do you think a Lexus that is made from Toyota parts only comes with a 3 year warranty? They do go wrong. Sorry did not respond to your end points. So...Lexus have some Toyota parts, in exactly the same way that Audi and VW share some parts with Seat and Skoda. Part sharing in common with platform sharing, enables cost efficient expansion of the model range and therefore widens consumer choice...take it that is something you like the rest of us are happy with. Yes Lexus car do go wrong, but...have you even noticed that for many years, year after year, Lexus are TOP of all unbiased and relevant consumer satisfaction surveys, for the standard of after sales and customer service on offer. Ford are where in these surveys, again...?. "Kia, Hyundai, Ssangyong, Toyota all cars with long warranties depreciate just as fast if not faster than Ford." By and large incorrect. Ford "list prices" have and are known to be the most flexible around, contributing largely to the Fiesta, Focus selling in volume terms, the most units...add this to the HUGE discounts that fleet, hire and body shop buyers negotiate and the obvious laws of economics are in play. Try bringing the typical local Ford dealer %age discount figure on a Fiesta to a Kia dealer and asking them to match it on a Rio...see where that gets you. "You can easily negotiate large discounts off a Ford unlike the brands with the longer warranty." Not sure if you realise, but you have just made my point for me again. Large discounts, are the necessary product of volume, mass market production...they must and do lead to terrible resale values on vehicles up to 3 years old...leading to inevitable low residuals and resulting higher lease rates on a car by car comparison. What would you, as a car buyer on a budget look for in a pre-owned family vehicle, one with little or no manufacturers warranty left, leaving you to soldier on alone or buy an insurance backed "warranty" riddled with exclusions...or peace of mind with eg a Kia, at 3 years old, still having around 4 years of manufactures warranty and the accompanying peace of mind?. The single biggest factor within Whole Life Costs is Depreciation (particularly for those who bought new), something which the uninformed private motorist, is forced to deal with at the end of the ownership proposition, staring them directly in the face, in the form of the part-ex figure that they find almost unbelievably low. You may know that Kia also offer private motorists, who buy a vehicle from their dealers, under 18 months old, will have the 7 year warranty topped back up, in effect and fact, giving the buyer a full 7 year warranty on a car already up to 18 months old...warranty only finishes when the car is eight and a half years old...any manufacturer beat or even match that , you know of...? I am an automotive/motoring fan of nearly 50 years and keep up to date with events as I am able and have NO affiliation with ANY vehicle manufacturer.